Kitchen organization is something many of us have in common, in that we need it—badly. Even when you’ve done a good job of getting organized, it can quickly fall back into disorder. So, how can we make make our kitchen storage endeavors stick? Well, that’s what we are here to discuss. We've talked a bit about the kitchen work triangle, but did you know there's a kitchen storage equivalent? 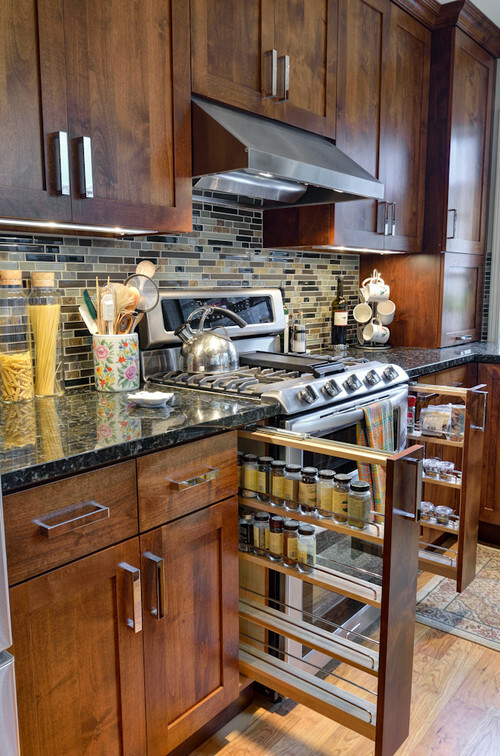 Have you Considered the 3 Zones of Kitchen Storage? 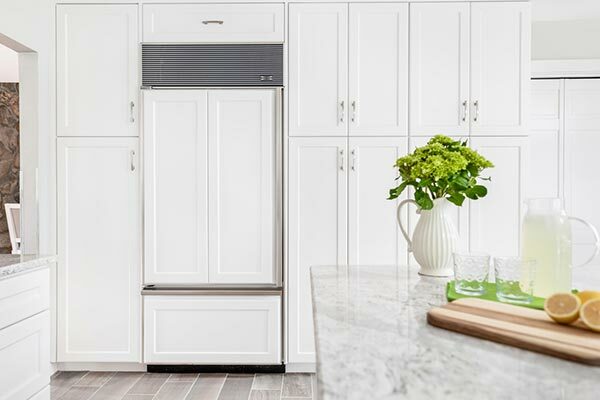 It makes sense since the same areas you work near the most - fridge, sink, and range/oven - are the same places you need easy access to kitchen items you use most. 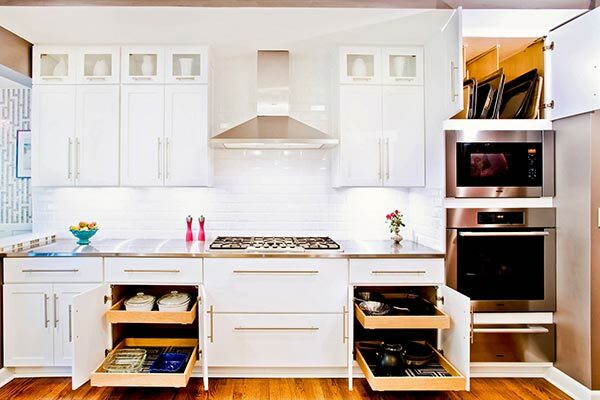 With that in mind, let's explore 3 zones of kitchen storage. 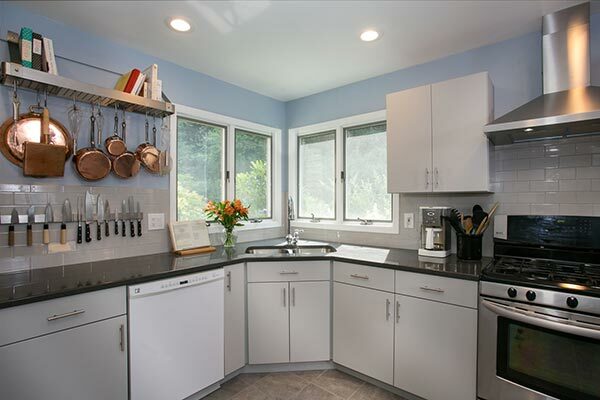 And, keep in mind that if your kitchen is used differently, your designer will look at how your kitchen is used to recommend common sense storage zones. Adequate countertop space to accommodate grocery bags. This could be alongside the fridge, or it might be just an arm's reach away via a peninsula or kitchen island. A narrow broom closet or cabinet that accommodates brooms, mops, whisk broom, dustpan, a Swiffer-style duster/mop and perhaps an inconspicuous electrical outlet for handheld vacuum/charging station. Cabinet organization for dry goods and condiments that go along with typical kitchen grabs - like cereals (so they're by the milk) or mustard/spices (so they're near the refrigerated condiments). 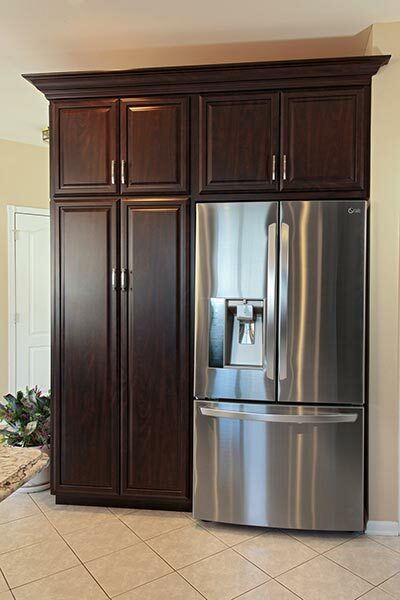 Larger cabinets for staple items. Since the refrigerator is so large, you can use that same oversized space idea and create a staple dry-goods storage area that houses napkins, paper plates, paper towels, water bottles, etc. 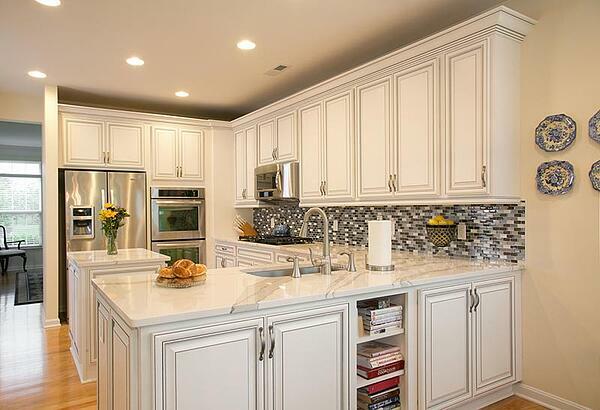 Space to store larger countertop appliances - especially if you don't have a kitchen island with storage. Examples include things like food processor(s) back up or extra coffee makers, grinders, bread makers and the other appliances you use with dry goods. Food storage containers for storing leftovers, for tomorrow's school/work lunches and easy-to-grab snacks. Shelves or countertop space for cookbooks. Open shelving near the fridge is a great way to break up the monotony of the expansive fridge and larger, adjacent cabinet boxes and they can house cookbooks. You can also use an overflow countertop section (like the one we mentioned for grocery bags) for cookbook placement. Did you know sinks get the most use and traffic of any other area of the kitchen? This is why centrally-located sinks and dishwashers - located between the fridge and range - work best for most households. An uncluttered kitchen is always a goal, but sinks should be the most uncluttered of all since it's use for food preparation, cleaning, cutting and housing dirty dishes. Trash and recycling stations, often done best via pull-out options integrated by matching cabinet doors. 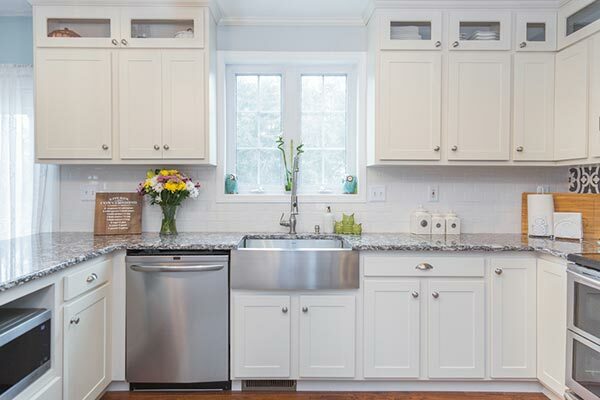 Organized drawers dedicated to flatware, as well as cabinets designed to house glass and dishware, taking access between the dishwasher and everyday dishes. Placing cutting boards and knives at mid-point areas between the refrigerator and the sink. Creating spaces for dishtowels, wash cloths, sponges and other tools used to wash/dry dishes or to clean up adjacent countertop areas. Always evaluate how to store items that are related to one another - such as coffee mugs and the coffee maker or water glasses and drinking water access (for example, drinking glasses are traditionally stored in upper-cabinets near the sink. However, Storage Zone 1 (near the refrigerator) makes more sense if your family uses the refrigerator's water dispenser. Finally, we come to the range/oven area. Usually, these are designed one of two ways: with a range and a cooktop above/below one another or a range that has separate wall ovens. If you have an open floor plan or a doorway from the kitchen to the dining room, it makes sense to locate the range/ovens nearby. First and foremost, pots and pans deserve well-organized, dedicated storage space within arm's reach of the range and oven(s). 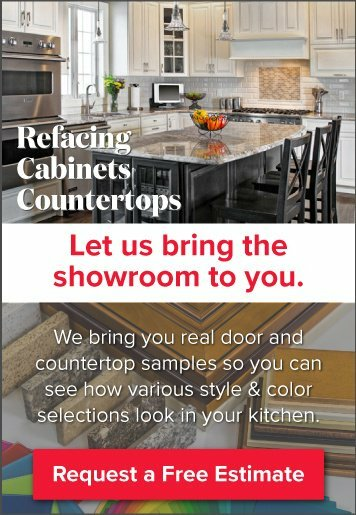 Nearby countertops to quickly deposit hot dishes onto a heatproof surface. Placing warming appliances, like Crockpots, in this area. 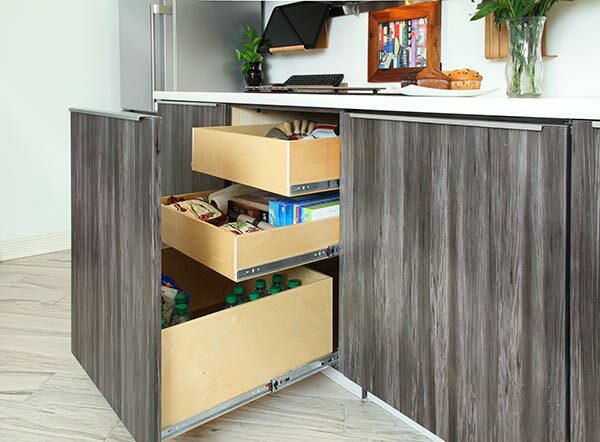 Ultimately, paying attention to kitchen storage zones increases kitchen workflow and accessibility. 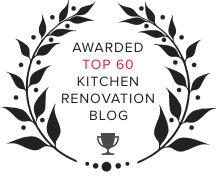 Contact us here at Kitchen Magic to get started on a customized kitchen plan that prioritizes your household's kitchen use and storage needs.